The German label CPO has a long tradition of producing recordings devoted to largely forgotten repertoire from 17th-century Germany. A couple of years ago it started a series under the title 'Musica sacra Hamburgensis 1600-1800'. Hamburg was a prosperous city, and that was reflected in the level of music-making, both sacred and secular, vocal and instrumental. So there is plenty to choose from to be recorded as part of this series. 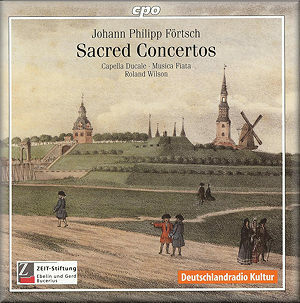 The present disc with music by Johann Philipp Förtsch was announced in an earlier volume as "Opera in the Church" - an intriguing characterisation. But what exactly is the reason for this? Most music-lovers know that Hamburg was an important centre of opera. In fact, the Hamburg Opera was the first public opera house north of the Alps. It was founded in 1678. One of the remarkable things about it is that one of its founding fathers was a church musician: Johann Adam Reincken, organist of St Katharinen. At the time of its founding Johann Philipp Förtsch was working as a tenor in the chapel of the city under the director of music, Joachim Gerstenbüttel. He was not from northern Germany having been born in Wertheim in Franken. He probably received his musical education from Johann Philipp Krieger in Bayreuth. The first signs of his presence in Hamburg date from 1674. In the 1680s he played an important role in the opera. First writing several opera librettos he then composed no fewer than twelve operas himself. It is a great shame that almost all music written for the Hamburg Opera during the first ten years of its existence has been lost; and that includes all of Förtsch's operas. Fortunately about eighty of his sacred compositions have been preserved, and they give some idea of his talents as a composer of musical drama. A considerable number of his sacred works are written in the form of a dialogue. That in itself is nothing special: many composers of church music made use of this form, as the Bible contains numerous passages in which a dialogue takes place. In Germany it was used, for instance, by Heinrich Schütz; examples are the Easter dialogue between Jesus and Mary of Magdalene and the dialogue between the 12-year old Jesus and his parents in the temple. It is no surprise, though, that the dialogue form was especially popular in Italy, the country of opera. It comes as no surprise that those German composers who had a special affinity with opera also liked to turn to this form. If indeed Johann Philipp Krieger had been Förtsch's teacher it is probably through him that Förtsch underwent the influence of the Italian dramatic style. In the case of Förtsch that means that passages which do not naturally lend themselves to dialogue are extended with free texts in order to enhance the drama. A good example is the stoning of St Stephen. In the Acts of the Apostles we find a long speech by St Stephen which ends with some sharp accusations against the Jews. They react angrily and then stone him. It is interesting to see how Förtsch treats this episode. The piece begins with a free poetic text: "He who loves Jesus must stand ready for all torments and bear his cross after him; he must like Stephen shed his blood if he would enjoy heaven's bliss." Then the first of the two accusations of St Stephen is quoted: "You stiff-necked men, uncircumcised in hearts and ears, you always resist the Holy Spirit, like your fathers, so you too." In the Bible the second accusation follows immediately, but here it is followed by reactions of the Jews. One person (alto) is saying: "This man does not cease to speak blasphemy against this holy place and the law". Two others (tenor and bass) add: "We have heard him speaking blasphemy against Moses and against God". Then together they scream: "Away with him, stone him". These are not quotations from the Bible, because in this episode it only recounts that the people react angrily to St Stephen's accusations; neither are the people or any individual person quoted. So these speaking parts are introduced for purely dramatic reasons. Then St Stephen's second accusation is quoted: "What prophets have your fathers not persecuted and slain, the prophets who once proclaimed the coming od this Righteous Man, whose betrayers and murderers you have become." Then tenor and bass enter again, saying: "We have heard him say: Jesus of Nazareth will destroy this place that Moses has given us". The three singers are repeating: "Away with him, stone him." When St Stephen says that he sees the heaven opened and Jesus sitting at God's right hand, they again ask for him to be stoned. At this moment free poetry is introduced again: the soprano sings: "O evil world, (...) you do not cease to grieve the Most High, until his wrath is thoroughly aroused". Then St Stephen's last words before dying are extended to another stanza of free poetry. Next follows a quotation from the Bible: "The righteous perisheth, and no man layeth it to heart." The piece closes with a quotation from the apocryphal book Wisdom of Solomon: "But the souls of the righteous are in the hand of God, and there shall no torment touch them." In the booklet Konrad Küster characterises Förtsch's treatment of biblical text thus: "For his compositions the Bible texts were redesigned so that they could assume the character of opera libretti, with the early experiences of the Hamburg Opera evidently serving as a source of inspiration here". 'Ihr Sünder, tretet bald herzu' is about Jesus' parable of the Pharisee and the Publican. This is hardly material for a dialogue, as in the parable there is no interaction between them. But by intermingling their respective prayers - "I fast twice a week, I give the tenth of all I have" and "God, have mercy on me, a sinner" - the contrast between the two persons is considerably enhanced. In between are the comments of Jesus: "He who humbles himself shall be exalted". Other subjects of dialogue are the Annunciation to Mary by the archangel (Du Heiden Trost), the message to Jesus from St John the Baptist (Die Wunder sind zu groß) and the parable of the rich man and Lazarus (Mensch, was du tust). In addition to the dialogs there are three Psalm settings: Herr, wie lange willst du mein so gar vergessen (Psalm 13), Aus der Tiefe (Psalm 130), Wohl dem, der nicht wandelt im Rat der Gottlosen (Psalm 1). The second item, 'Kommt, lasset uns gehen gen Bethlehem' is a sacred concerto, a mixture of dictum (biblical quotation) and free poetry about the shepherds going to Bethlehem to see the new-born Jesus. As one would expect, vocal and instrumental parts express the text and its content in an eloquent way. Variety of pitch, repeating of phrases, sudden pauses, coloraturas - every tool composers had at their disposal is used to communicate the message of these compositions. The performances by the Capella Ducale and Musica Fiata have been recorded live, but there are hardly any background noises, and technically the level of the performances is impressive. As far as the interpretation is concerned, Roland Wilson has brought together an almost ideal team of singers. Everyone of them gives outstanding performances of their respective parts. It should be noted, by the way, that in the dialogues the various roles are not given names - just the type of voice. Wilson has also done a fine job in the distribution of the various roles among the singers. The instrumentalists deliver strong contributions to the drama as well. The overall approach of these compositions is the key to their communicative power. I have some critical comments to make, though. I noted several discrepancies between the texts as they are sung and as they are printed in the booklet. Partly this is most likely the result of a 'modernization' of the text. For instance, in Psalm 13 the first line is printed as "wie lange wiltu mein so gar vergessen", but it is sung as "willst du". And in the same Psalm "für dir" is modernized as "vor dir" - according to the modern rules of grammar. I find this rather odd. I also don't understand it, because I have never noticed anything like this in previous recordings by these ensembles. But I also noted some apparent slips of the tongue. For instance, in Psalm 130: "Denn bei dir ist Vergebung, dass man dich fürchte" - "For with you there is forgiveness that one may fear you". But instead of "dich" we hear "sich". In the dialogue about Lazarus and the rich man the line "Die allhier mit Lust und Scherzen" (that here for mirth and pleasure) has become "Lust und Schmerzen" (mirth and pains). Even in the case of a live recording this should have been corrected afterwards. Maybe a studio recording would have been preferable after all. There is a painful error in the programme notes in regard to the dialogue about the Pharisee and the Publican. The descriptions of the respective parts have been swapped: it is said that the latter is "pious on the outside", but that is how the Bible and Förtsch's dialogue describe the Pharisee! I would have expected the booklet text to be proofed before printing but perhaps the proofreader overlooked it. These errors in no way diminish my appreciation and admiration for this release. They are however serious blots on a historically very interesting and musically enthralling disc. It is sad that far too many CPO productions are damaged by sloppiness in the production department.